Liposculpture or liposuction is a surgical procedure that consists in the suction or injection of subcutaneous fat, as it may correspond, to achieve proportion and harmony of the body contour. 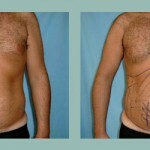 The arrival of liposuction to the aesthetic plastic surgery field has been one of the greatest “booms” of these times. This surgical treatment is not a weight-loss method; its goal is to reshape body areas that may be producing an aesthetic imbalance. Therefore, it is performed in all the patients who present localized fat deposits, which could not be battled through diet, neither physical activity. It is a technique that can give excellent results, partially regardless of the method used (conventional, ultrasonic, tumescent liposuction, etc.) and with a suitable indication and the surgeon´s surgical ability. Since years, the extracted excessive fat from hips, thighs and abdomen, we reinject it in the buttocks, achieving more gluteal volume and projection in a natural way. What type of anesthesia is the operation performed with? This depends on the magnitude of the zones to treat. If it is a minor to moderate liposculpture, local anesthesia plus a sedative provided by the anesthesiologist will be enough. In a high percentage of cases, we use epidural anesthesia, plus sedation and in other few cases general anesthesia. How it is the surgery like? After marking the areas to treat and once the anesthesia is working, we make small incisions of about 3 milimeters in places where they can be afterwards disguised. Through them we insert thin cannulas which we suction the deep fat with, to avoid skin imperfections. 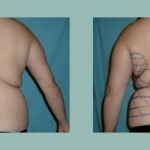 The most important thing in any liposuction is not the amount of fat we extract, but the amount of fat we leave. What should be considered to obtain an optimal result? In general, it is intimately bounded to age. In young patients, with firm and elastic skin, better results are achieved than in people with less elastic tissues and diminished skin tone. It should be avoided to perform the procedure when the tissues have the aforementioned characteristics, except in the cases where the liposuction is associated to skin resection. It must be practiced in located fat deposits; being contraindicated when the overweight is harmonious, well distributed, because liposuction doesn´t replace a weight loss plan, (which would be the suitable treatment in this case). It is fundamental to talk with the patient about their expectations with regard to the treatment and, at the same time, to explain the possible result considering the method’s limitations. Which areas can be liposuctioned? Many procedures nowadays involve the simultaneous treatment of more than one anatomical region. The operation can be performed in the back, hips, trochanteric region, (“culotte de cheval”), knees, inner thighs (crotch), double chin, brachial region (internal part of arms), abdomen, breasts, gluteal region, legs and ankles. Liposuction is also performed with gynecomastias (breast reduction surgery in men), and to complement aesthetic surgeries, such as face and neck lifts, abdominal dermolipectomies, breast reductions, etc. How is the postoperative evolution? Usually, after the intervention the patient can go home within a couple of hours. In few cases, due to the extraction of great volumes of fatty tissue or if general anesthesia was given, it is advisable to stay in the clinic overnight. During the post-operative, a compressive lycra band should be used in the liposuctioned region, to help diminishing the edema -swelling- and to shape the area, during 2 or 3 weeks. Physio-therapeutic treatments are advisable, (lymphatic drainage, ultrasound) and begin in the 2nd post-operative week. Post surgical edema (swelling) always occurs and disappears progressively in 2 to 3 months approximately. The apparition of ecchymosis is frequent (small hematomas), which disappear in 15 or 20 days; and so is hyposthesia (partial loss of sensitivity), which evolves quickly back to normal. Insufficient or excessive liposuction can cause irregularities, asymmetries or depressions in the body contour that can be solved with “adjustments” under local anesthesia, suctioning or injecting some fat as it may correspond. Other complications can happen, although they are infrequent. There is no pain during the surgery, due to the action of the anesthetics. Once their effect passed, there´s usually a certain discomfort in the suctioned areas, which are handled effectively with analgesic medication. Delay in returning to work? Each patient is different and each procedure too. It is usual to perform an intervention on Friday so that the following Monday the patient is working. In general, with procedures of minor or medium magnitude, patients return to work in 3 or 4 days. If it´s a major intervention, they can do it in about 5 to 7 days. In minor liposuctions, it is recommended to wait 4 to 7 days. In major interventions, no less than 3 weeks. It is detrimental to expose yourself to the sun right after a liposuction. This produces vasodilation and edema, with an increase of the discomfort and delay in the patient´s recovery. You should wait approximately 4 weeks. Considering its safety and effectiveness, liposculpture has become one of the most used procedures to achieve proportion and harmony of the body contour.